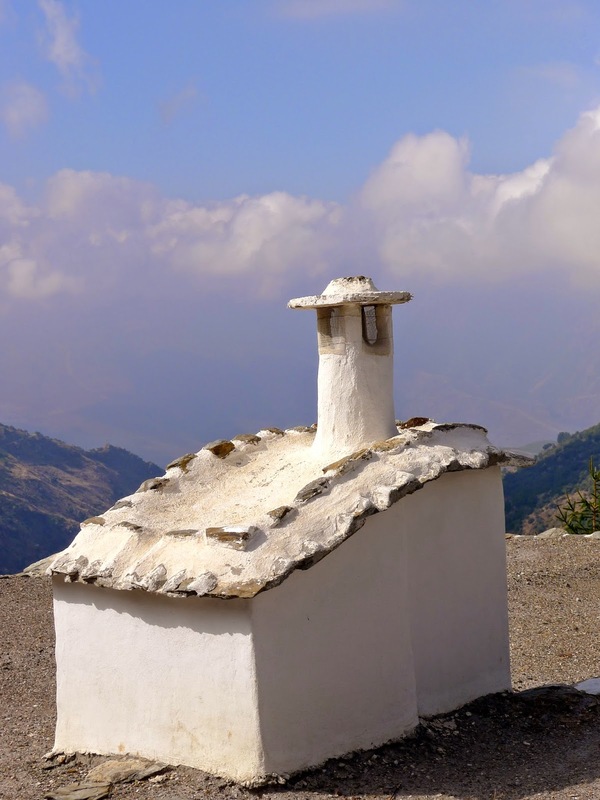 Yesterday we took a drive high up into the Sierra Nevada Mountains to see the white villages of Las Alpujarras. The road was narrow and winding and twisted its way to the remote villages. The terraced farmlands are constantly watered by melting snow from above. As we drove along, I kept asking myself "What must it be like to live here?" "What must it be like to live here when it SNOWS?" "Where do the children go to school?" No answers, but lots of questions. Each village we visited was full of vacationers and locals. The restaurants and shops were busy with eaters and servers, buyers and sellers. Lots of tourists could be seen poking about the side streets clacking photos. Men took up space on park benches chewing the fat. When you can't get to the shop, the shop comes to you! The bread man arrives in Capileira. Catching up on the latest news. I am obsessed with chimney pots! Look at these beauties. If this was a house, I'd live in it. It's no wonder people live very long lives in this part of the world. Everywhere is either up or down in these hillside villages. 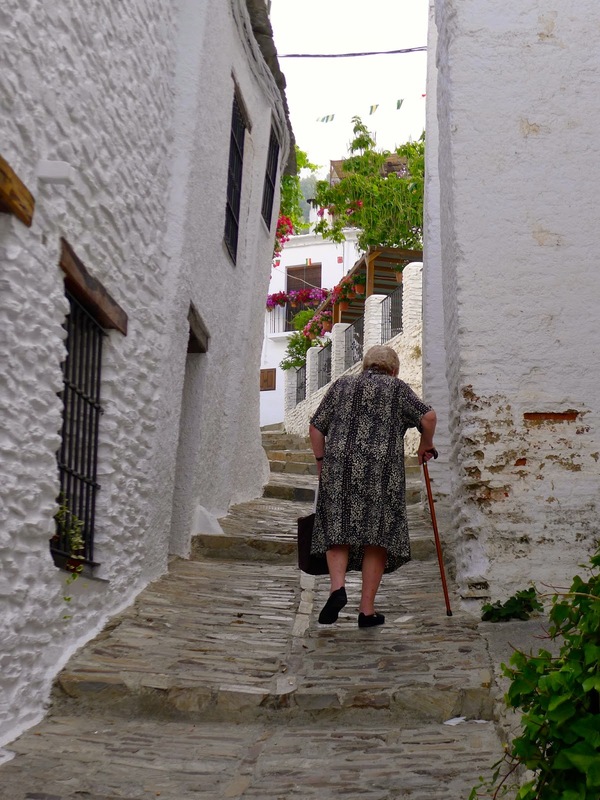 This elderly woman was slowly but surely making her way up the cobblestone stairs. Even with a cane! From our restaurant table, we watched this man lead his horse down the road. A few seconds later we saw him return without his horse and enter the restaurant. We wondered, "Where is his horse?" After lunch we saw where the man had parked his horse. With the cars, of course! As you know, Joe desperately wants to bring an Iberian ham home to Canada, but pork is on the restricted foods list. 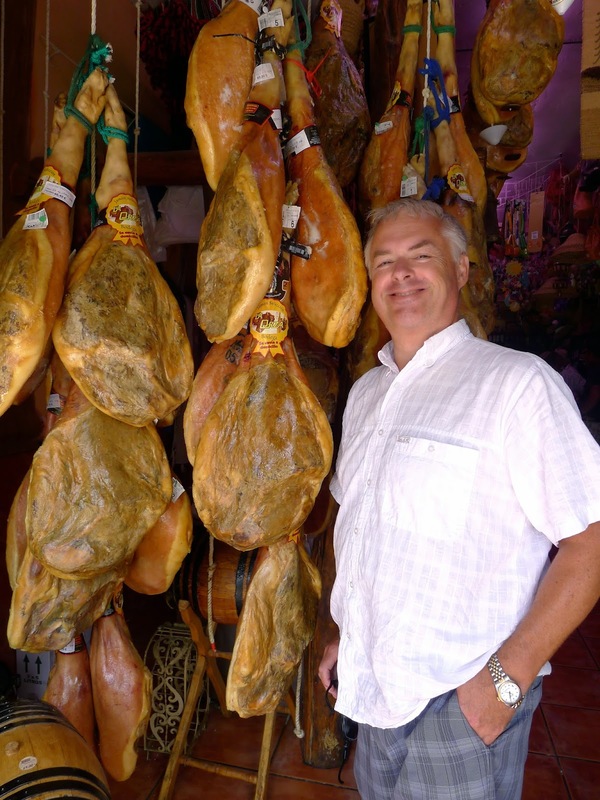 For now he has to be content with posing for photos with his beloved Jamon Iberico. At long last! I am reunited with my Spanish relatives. And that, my friends, was our day high in the Sierra Nevada mountains. What a spectacular part of the world.